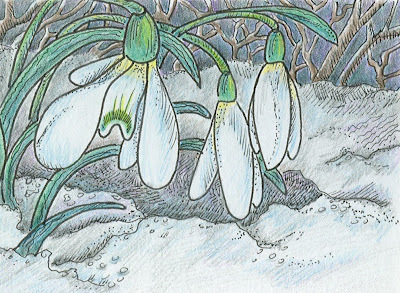 This is an ACEO or artist trading card of snowdrops I did for an entry into an exhibit on EBSQ for "Flower of the Month" (FLOTM) for February. These ACEO's or ATC's are the size of a regular playing card 2 1/2" x 3 1/2" and are fun to collect or trade with others. You can frame them or put them in a photo album. 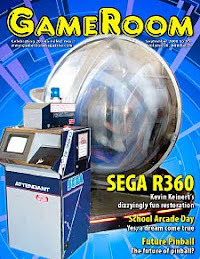 It is a fun way to collect art from other artists and see all the creative talent out there. 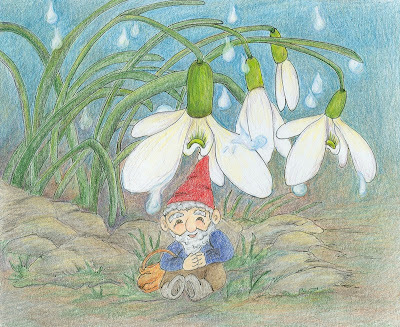 This is another one of the pictures I submitted for the "Flower of the Month" FLOTM, which was SNOWDROPS for an exhibit for February at EBSQ, where my art portfolio can be seen at http://www.ebsqart.com/Artists/cmd_7348_profile.htm. I have been reading up on gnomes and found out they are really helpful little woodland folk. They will take care of ailing or injured forest animals and plants. I like that, as I am an animal lover and love to garden as well. So I think I will have to get one of those little garden gnome figures for in my garden this summer. This piece is a small format artpiece measuring 5" x 6".